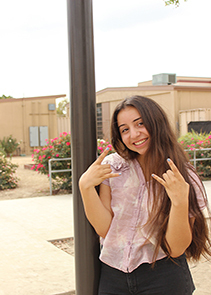 Senior Vivian Buenrostro is not only a writer for The Downey Legend online newspaper, but has also taken on the responsibility of Co-Editor-In-Chief. Having been a part of the newspaper staff since her sophomore year, she has experience with the different positions and has even held the positions of Arts and Entertainment Section Editor and Song of the Week Editor. “Newspaper has been one awesome ride these past three years,” Buenrostro said. “I’ve learned skills that are applicable to everything and anything.” Although Co-Editor-In-Chief is a tough and tedious job, Buenrostro is ready to take on the challenge. Throughout this year on staff she hopes to build a close bond with all of the staff members and have productive deadlines. When she is not running the staff or writing stories, Buenrostro enjoys jogs around her neighborhood, making healthy shakes and other concoctions, or swimming in the waves at Huntington Beach. “Time doesn’t really exist when I’m in the ocean,” Buenrostro said. Buenrostro also loves live music; she has been to various concerts including Young the Giant, Arctic Monkeys, and Walk the Moon. Buenrostro plans to graduate and attend an out of state school far from California. “As much as I love Downey High,” Buenrostro said, “I can’t wait to go to college in a new environment.” While away at college she hopes to major in biology and medicine to start her path towards her career goal of being a doctor. Buenrostro aims to make her final year at Downey High School rewarding in both her academics and her position on The Downey Legend staff.